The topic of "women and writing" has been on my mind quite a bit recently - there have been any number of thought provoking stories in the news recently, among them: Sheryl Sandberg zooming to the top of the Amazon bestsellers list and encouraging us to Lean In, a inspiring interview over at WBUR's On Point with the author of a new biography of early feminist and transcendentalist Margaret Fuller, and a lot thoughtful discussion around the blogosphere considering balance and imbalance of male and female contributors to literary magazines. 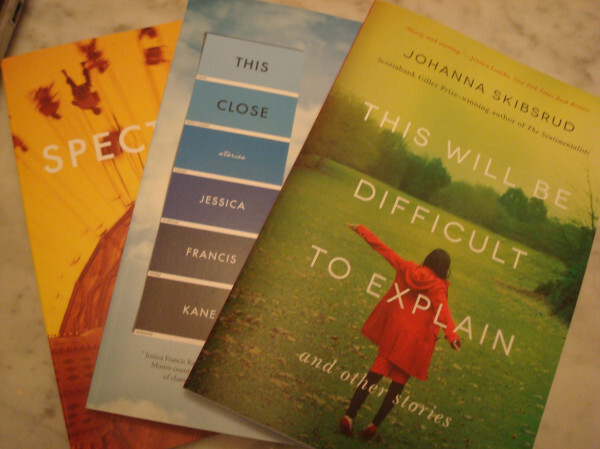 So when the forces of the universe (by which I mean Powells.com and a charitable publicist) recently conspired to deliver this lovely trio of short story collections by women writers to my mailbox, not only was I thrilled to have them to read all at once, it seemed a serendipitous moment to highlight them together on the blog. I loved Kane's novel The Report (Graywolf Press, 2010) and have been looking forward to her short story collection for a while - when it arrived, I eagerly devoured it in a day. 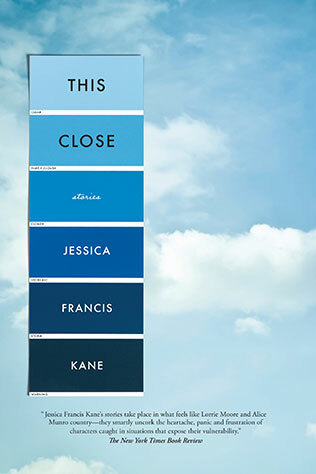 Kane has a quiet yet elegant way of exploring places of disconnection and uncertainty between people - just as those spaces seem to expand and contract along with our emotions and relationships in real life, so do they in the stories of This Close. Parents and children are strongly represented in the collection - we meet a mother coping with the loss of a child, an adult daughter struggling to understand both her aging father and her place in her neighborhood, an alcoholic mother trying to stay connected to her teen. I found them moving and resonant. This charming collection of stories from Scotiabank Giller prize-winning author Johanna Skibsrud takes us across the U.S. and around the world: Skibsrud's characters are young Americans working in restaurants in Paris or French summer resorts; the wife of a hardworking ranch hand who has just lost a prize bull and with it, the family's savings; lifelong friends reuniting in Japan after many years apart; the mother who supports her child through a difficult time, only to leave her marriage when it is over. 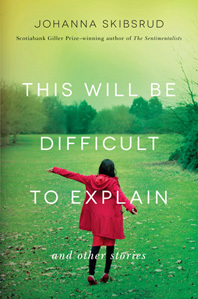 If there is a central theme to this subtle and lovely collection, it might be the fragility of life and our connections to each other, and how we forge ahead, together, despite it. 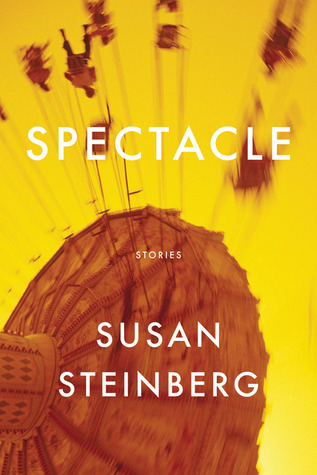 Susan Steinberg strips everything away in this edgy and sometimes challenging collection. In stories with inventive forms and language that often read like poems - not the flowery kind - her characters speak to us in the first person, simultaneously confiding and confessing. We are privy to damaging life experiences and dangerous thoughts, told of hurtful fathers and absent mothers, various encounters with boys, and more than some inner conflict about being "good." I chose this collection knowing it would be one that stretched me as a reader, and while these stories weren't the best fit, I was impressed with Steinberg's unique style and willingness to go to risky places. Recommended for adventurous readers of experimental literary fiction. Daring Books for Grown Up Girls, a post I wrote last year about some other excellent short fiction by women writers, including Elissa Schappell, Megan Mayhew Bergman, Caitlyn Horrocks, Xu Xi and others. I purchased This Close and Spectacle from Powells.com. My thanks to the publisher for a complimentary review copy of This Will Be Difficult to Explain. I know it's a big theme of short stories as a whole, but I love the exploration of disconnection and identity writers use in their stories. For that, This Close appeals to me perhaps the most out of these three collections, there's just something about those themes and the nature of short stories that means it's often so much more thought-provoking than novels. I so agree, Charlie! I like those themess too, and short stories leave so much more to the imagination, and so much more to ponder afterwards. The book of short stories by a female author that resonated most with me is a little obvious-- Interpreter Of Maladies by Jhumpa Lahiri. Her stories are so intensely insightful. I hope you enjoy it, I really liked the stories. Interpreter of Maladies is a wonderful collection, would love to reread it someday. Love her stories! these all look really interesting. i have THIS CLOSE in my pile and it looks good. hope you enjoy it - look forward to hearing your thoughts on the stories!